I was on a small vacation in Brasov for a few days and also brought some wines from home to make the journey cozier and more entertaining. A glass of good wine drank inside a warm cabin with a nice window view of a mountain covered by snow and a forest of Christmas trees with calm snow falling down the sky made up for a heavenly background and a relaxing atmosphere. There was also some going out to visit some of the restaurants in Brasov and unfortunately one of them was a fairly big disappointment. I visited Casa Hirscher several times in the past, the place is decorated nice with a green house like covered terrace that is brilliant to use on a cold or rainy day and usually the dishes have a nice appearance. But the food was pretty mediocre this time and both me and my wife had indigestion after we had lunch there. 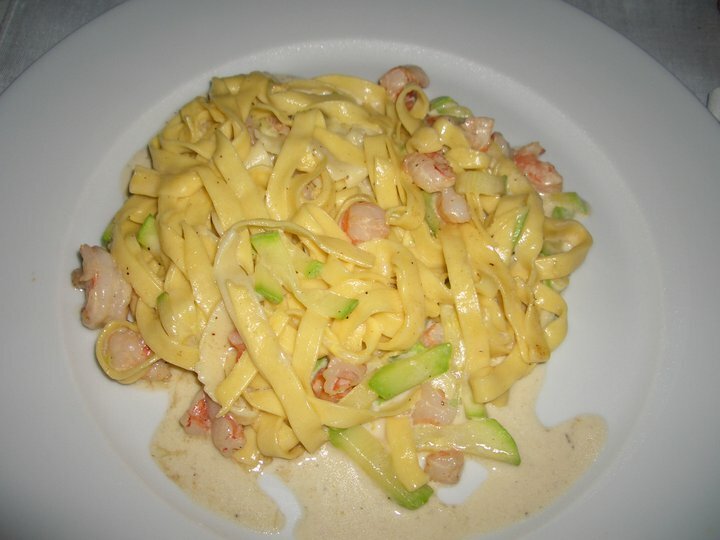 We had a tomato cream soup as a starter, which was all right and I had home made pasta with black tiger shrimps and my companion a dish with two types of fish, mussels and shrimps. The mussels had a bad muddy taste and the sauce in both dishes was so heavy that made us felt sick the entire evening after leaving the restaurant. This is a place I will not visit too soon. Beware if you order fish or seafood here. It is pricey and I do not think the cost is justified. On a more positive note I tried some wines, recently bought from abroad, that were absolutely outstanding. The wine is made of the rare Grenache Gris grape and comes from the Languedoc area. The wine is labeled as Vin de table Francais and therefore it cannot specify the vintage on the label. 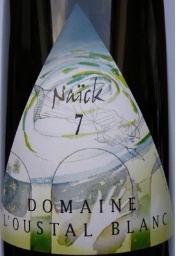 But the producer found a very ingenious way and labels each vintage with the appropriate last digit e.g for 2007 the wine is called Naick 7, for 2006 is Naick 6, 2005 is Naick 5 and so on. The wine has a deep gold color. The nose is tight initially, but as it opens up thick layers of exotic spices mixed with an oily-petrol aroma, a discreet touch of wet rocks, honey, smoked quince and yellow flowers build very elegant and complex aromas. In the mouth the wine is hyper concentrated, full body, with big exotic spices, ginger, a nice lifting minerality, nice ripe stone fruits and a beautiful acidity. 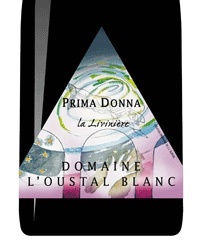 There is a long finish with a good mineral aftertaste that brings freshness and makes the wine vibrant. I looked on the back label only after I finished the wine and saw the 15% alcohol level. I was really surprised about the high alcohol level and how perfect it is integrated because the wine has such a thick texture, is rich in glycerin and yet feels so easy drinking and shows a perfect balance. An absolute stunner and Excellent+ wine. This wine reminds me of the beautiful Chateau Puech Haut Tete de Belier Blanc 2008 and has similar appealing aromas as the 1997 Zind Humbrecht Pinot Gris Clos Windsbuhl I tasted earlier this year. Blend of Syrah and Grenache Noir. The wine has a dark red with purple hues color. Nose shows light shades of discreet oak with a lactic sweet aroma, red currant, blackberry, dark pepper, fresh strawberries give a nice lift and licorice. In the mouth the wine is full body, with flavors of blackberry, plum, licorice, spicy, very rich in cocoa, coffee bean, with nice acidity, black pepper and dark chocolate beautifully coating the mid palate. Great balance and no sign of heat from the 14.5% alcohol. The finish is long, leaving a rich layer of black pepper and cocoa: I love it. Excellent+ wine. The strength of this wine is the long finish, the intensity and the purity of the flavors in the mouth. This wine goes so well with a dark chocolate with 65% cocoa, a perfect combo as I just tried it. Philippe Cambie, a renowned winemaker from Chateauneuf du pape working for Domaine du Pegau and many more famous producers in the area including Chateau Puech Haut in Saint Drezery, Languedoc, is a joint owner of l’Oustal Blanc and also the winemaker. There is amazing quality in these wines. I strongly recommend you to seek and try their wines as you will not be deceived. This year I wanted a different type of food for Christmas. Romanians usually go big on pork for Christmas: plenty of cold sausages, porchetta and different more pork based products as appetizers. 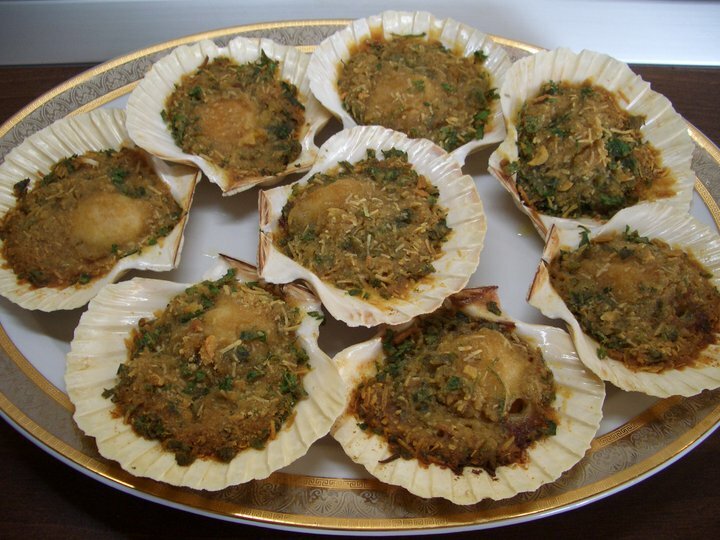 Then the “sarmale” which is minced pork meat mixed with rice, spices and wrapped in cabbage layers then boiled for hours. Then come the fried sausages and different types of pork steak: baked with sauce, grilled or many other variations on this line. I personally reduced the consumption of pork for some time now and I cannot actually remember the last time I had pork. I am big on vegetables and prefer beef or chicken when I eat meat or plenty of fish and seafood. Therefore this year I tried to have a lighter meal for the Christmas. Plus as we spent Christmas with my parents it was a great chance to share on one meal some of the tastier dishes prepared during the last year. 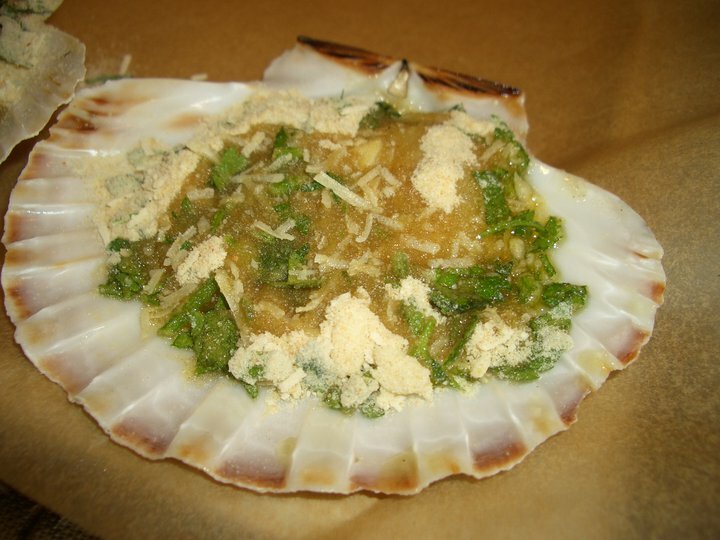 – Coquilles Saint-Jacques with garlic, parsley, parmigiano regiano, rasping with olive oil. Florin was kind enough to share this recipe with me and it was really tasty as this was the first time I made it. 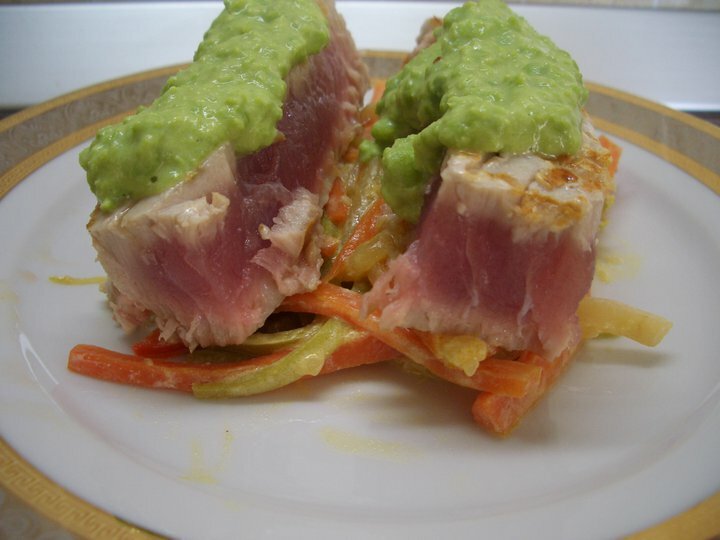 – rare tuna steak with mashed sweet peas and a mix of vegetables and sour cream. 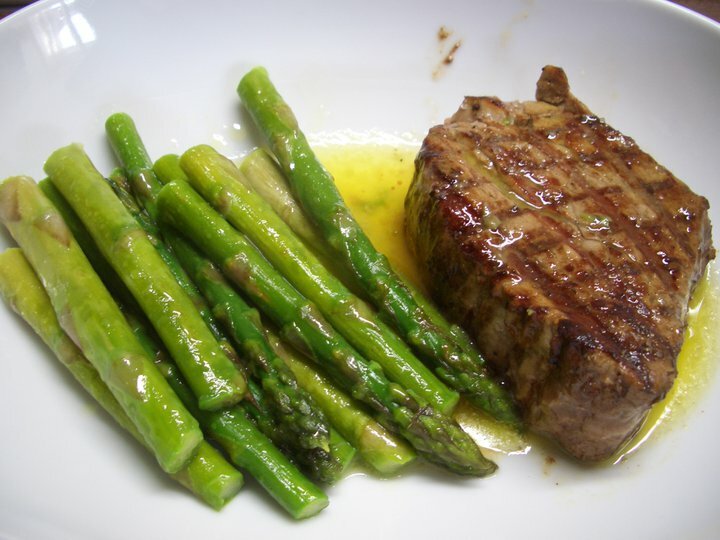 – as the final dish a rare beef steak with asparagus was a great match for the 14 years old Bordeaux served. The melted butter used to roast the asparagus juiced the beef and made it so tasty. 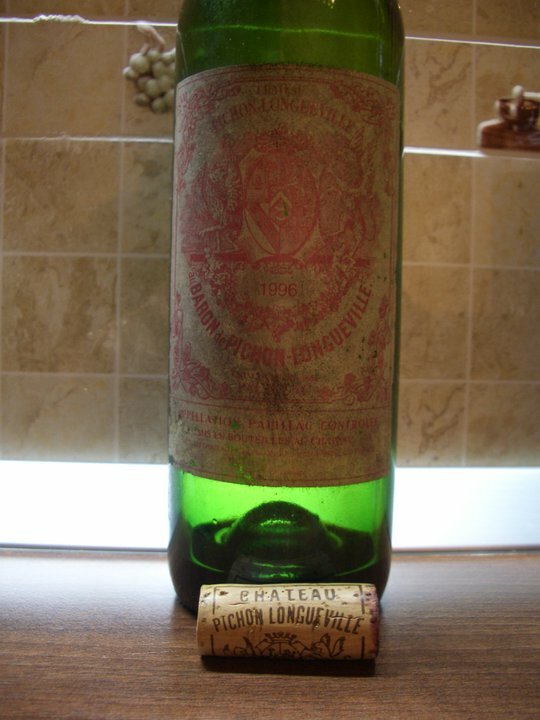 I started to appreciate older wines for a few months now quite a lot, especially old Bordeaux. 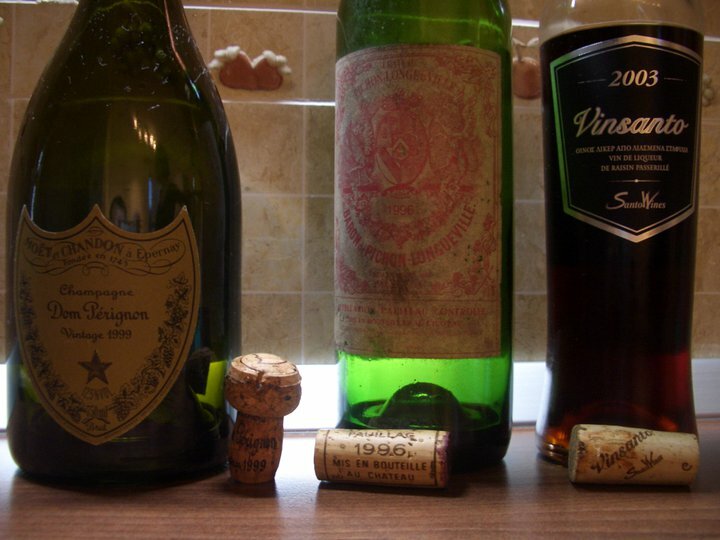 Therefore I tried to have some older vintages for this special meal with the family. With one exception which was the sweet 2003 Vinsanto the other two wines were an 11 years old Vintage Champagne and a 14 years old claret. The wine was paired with the first two dishes. It went very well with the Saint Jacques and it went pretty well with the tuna dish. The sour cream used for the mixed vegetables paired well with the sparkling. The wine has a light gold color. The wine has a big effervescence with very smooth bubbles. The nose is elegant with aromas of brioche, yeast, tar lemon, baked apple, with aeration aromas of almonds and hazelnut build more complexity. In the mouth the wine is classy, medium plus to full body, with a creamy mouth feel, plenty of texture on the mid palate and beautiful mineral flavors mixed with tar lemon, white pepper and white fruits. The finish is long and elegant with no sign of age. A beautiful and Excellent+ sparkling wine. The wine has a deep dark red color with red garnet color to the rim, there is really no sign of age for this wine. The nose is elegant and complex: aromas of blackcurrant, autumn leaves, forest floor, mushrooms, old leather, cedar, mint and with aeration aromas of green vegetables: green bell pepper and asparagus build more complexity on this beautifully evolved 14 years old wine. In the mouth this wine is like silk with flavors of red and black currant and discreet ripe cherry, mixed with cedar, sandalwood, green pepper, coffee bean, tobacco and leather. The wine is medium to medium plus body with great balance and very elegant. There are firm tannins present on the medium plus finish that show this wine has plenty of years left and a nice bitterness with a big mocha aftertaste. Excellent+ wine. 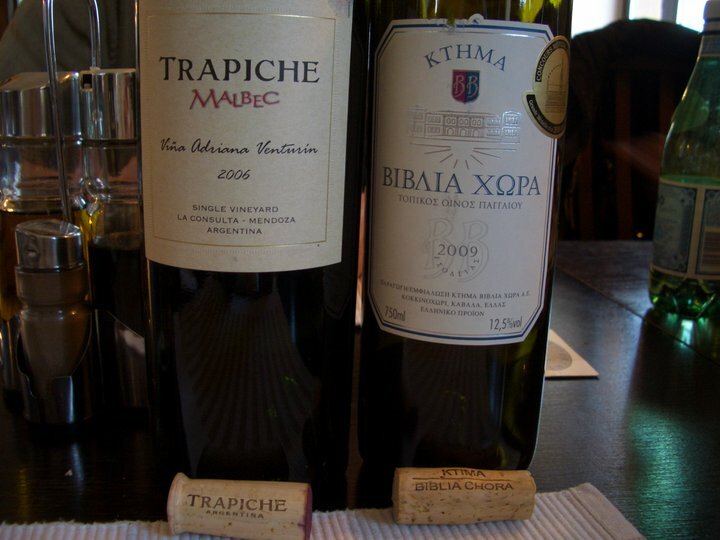 Sweet wine style produced in Santorini, Greece, from sun-dried Assyrtiko and Aidani grapes. Requires long aging both in oak and bottle. 16% alcohol and the label says Vin de liqueur. As far as I know about this type of wine (I might be wrong as I did not manage to find too much on the subject and I am not close to my wine books), alcohol is added in the must to stop the fermentation process. Will do more research and update this post later on. The wine has a deep amber color. The nose shows figs, dry apricots, honey, baked quince, caramel, a very sweet nose. In the mouth the wine is lusciously sweet, huge on figs and baked quince with a lifting acidity. The finish is very long and quite fresh for such a sweet wine. Excellent wine. This wine goes very well paired with dessert or a Cigar to end a big meal. I hope that wherever you spent your Christmas you had a good time and you spent this holly day with close friends and family. As we are approaching the end of the year and Christmas is almost here, I am in a mood to try some more serious wines. This time: two heavy weight red wines from two very serious producers from Languedoc. Both of them are blends of Grenache, Syrah and Mourvedre and both producers are almost maniacs about low yields in their wines. Chateau Puech Haut is a producer I know since 2008 and I enjoy their wines a lot. So far I had the 2004 and 2005 Tete de Belier Rouge and the 2006 and 2008 Tete de Belier Blanc. All their wines are complex and have amazing depth and flavors. This time I tasted one of their top cuvee: Clos du Pic. Together with the 40eme, made only in the best years(they made it in 2001 and then only in 2007 again), the Clos du Pic is coming from tiny yields of only 1.8 hectoliters per hectare. The result is a wine with an amazing concentration. Started in 2004 and neighboring the well known estates of Grange des Pères and Daumas Gassac, La Pèira has already a stellar reputation and is a success story. It produces just four wines — a white(Deusyls) and three reds( top cuvee La Peira, Las Flors – blend of Syrah, Grenache and Mourvedre and Les Obrires de la Peira- blend of Carignan and Cinsault). 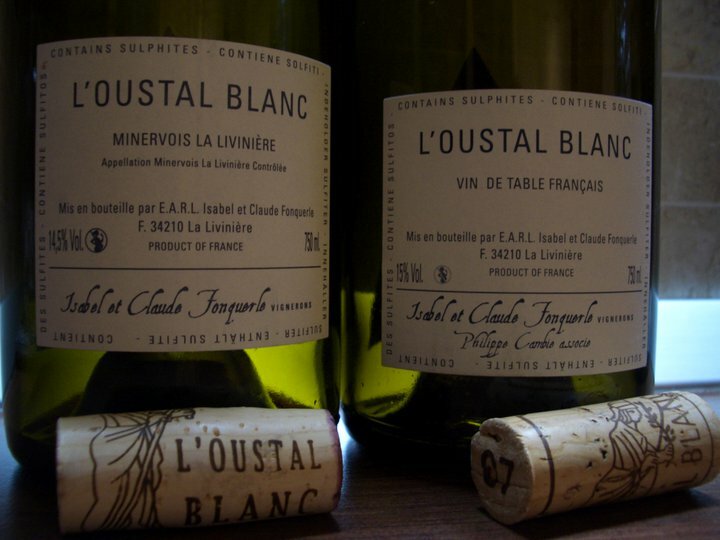 The reds have won the biggest attention but their white not only comes in very limited quantities(about 1,000 bottles per vintage at most), it is also a very interesting blend of Viognier with less Roussane aged for up to 24 months in French oak. Behind La Peira venture are UK music composer Rob Dougan (“Clubbed to Death” from the Matrix soundtrack), winemaker Jérémie Depierre and consulting eonologist Claude Gros(the person behind another Grand Cru of the Languedoc – Chateau de la Negly with La Porte du Ciel and Clos des Truffiers, other monster wines). Their wines received stellar points from prestigious wine critics starting with their first vintage. Wine advocate gave for the 2007 vintage 96 points for La Peira, 94 p for Las Flors and 92 P for Les Obriers and similar high grades for 2005 and 2006 vintage. The best part is that the wines still have very down to earth prices. Both wines tasted in this session have amazing opulence, full bodied, powerful mouth feel and a multidimensional layered finish with a very long aftertaste. The wine has an opaque dark red almost black color. The nose is very polished, elegant and complex. Aromas of meat- beef blood, massive spices – dark pepper and mint, black olives, candied dark fruits – blackberry, mulberry and dry plums and nice floral aromas of lilies. The end result is an elegant, big and complex nose. In the mouth this full bodied wine is decadent, with an initial salty attack that develops with dark chocolate, spicy, peppery sweet ripe dark fruits – blackcurrant, blackberry, plums, coffee, with firm tannins and nice acidity. The balance in the mouth is outstanding, perfect integration of the 14.5% alcohol and nice freshness with some lifting minerality. The finish is very long, thick layers of bitter-sweet chocolate, black olives and ripe fruits build a long aftertaste tempered by firm drying tannins. The wine has freshness and elegance. Excellent+ wine. This is coming from a very hot, but amazing vintage in the South of France. The wine has an opaque dark red with purple hues color. The nose is more hedonistic, meatier and with more dramatic animal aromas: beef blood, musk, balsamic vinegar, some dried tomatoes, candied dark and red fruits – plums, dark cherry, blackberry, big dark pepper and cocoa aromas with a little bit of mint. In the mouth this full bodied wine has great concentration and depth with flavors of sweet candied dark fruits, cocoa, very spicy: the black pepper is huge, cloves, meaty, a round mouth and firm but silky tannins. The finish is very long with bitter-sweet chocolate and candied spicy blackberry. We have a wine with a perfectly balanced 15% alcohol, but the wine has flavors flirting with over ripeness. Nevertheless it still is a juicy wine. Excellent+ wine as well. 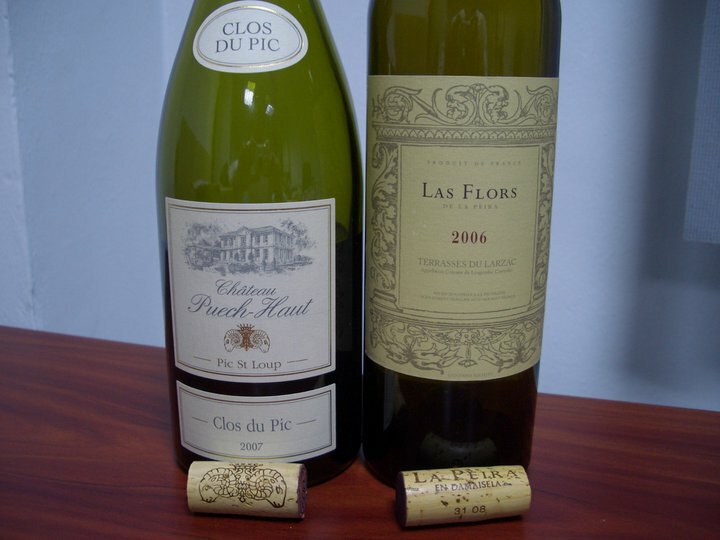 As much as I enjoyed both wines tremendously, I have to be sincere and say that my favorite was the 2006 Las Flors. The wine has better freshness, balance, is better polished and more elegant. 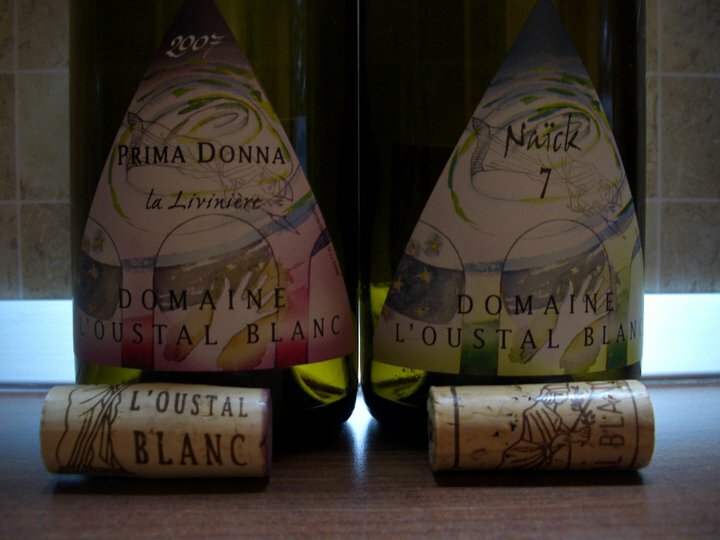 If you are able to find these wines I strongly recommend you to try them as they are examples of the greatness the Languedoc has to offer. Yesterday I paid a visit to Metro Baneasa and their tuna file was very appealing so I bought some. 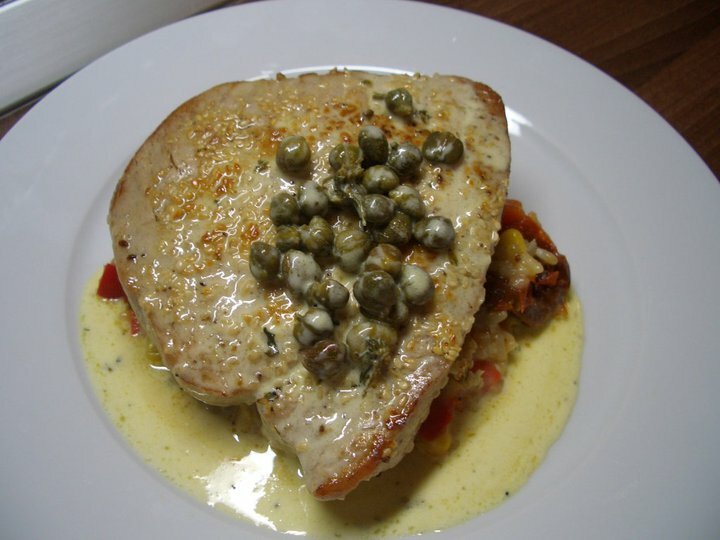 Therefore last night I made a tasty tuna steak with sesame seeds in a sour cream, capers and thyme sauce. Since I did not have any more fresh vegetables in the fridge the side dish was prepared using a frozen mix of rice and vegetables. Not the same thing as fresh vegetables but it went well. The whole cooking process took about 15 minutes and the final dish was very good and appreciated by my better half. The tuna pieces with some sesame seeds on top of each side were roasted in a pan for about 2-3 minutes on each side. 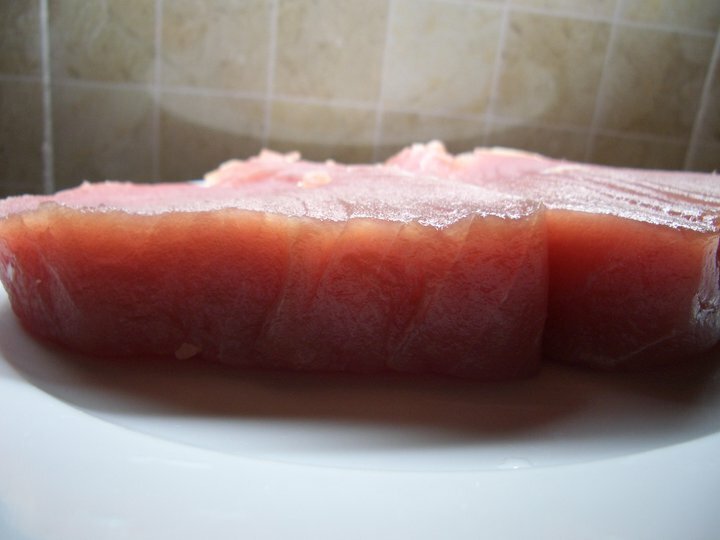 I usually like my steaks rare to medium rare so this 2-2.5 cm thick tuna was no exception. 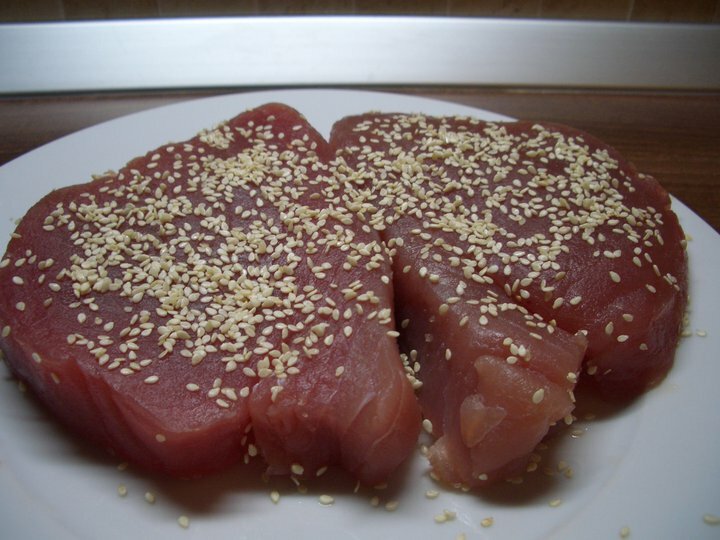 Two to three minutes for each side is enough to brown the sesame seeds and the tuna, leaving a pink-light red on the inside. The vegetables mix was done in 7-8 minutes and for the sauce I used a very fat sour cream( I think over 35% as it was bought directly from the farmers outside Bucharest) heated on a pan for about 2-3 minutes with capers, a little bit of olive oil and some green thyme to add depth to the sauce. 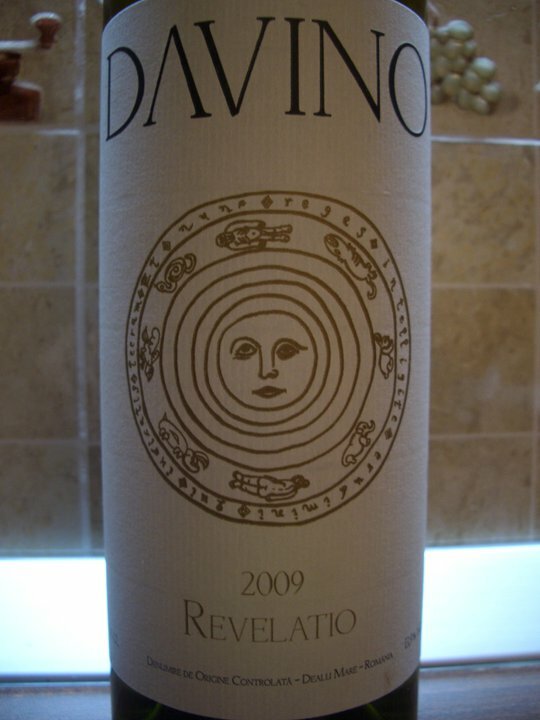 The wine pairing was a leftover from SUN, a Davino Revelatio 2009. I opened this wine for the SUN lunch, also fish based, but last evening the wine was a better company to the richer tuna. Kept in the fridge with a vacuum cork the wine maintained its aromas and flavors very well. A blend of Sauvignon Blanc and Riesling. I received this wine as a gift for my birthday so I do not know the price level. I am content that I had the chance last week to taste a similar blend Cuvee Amaury 2009 from Serve. Even if both wines come from the same Dealu Mare/Ceptura region and are using the exact same grape varieties in the blend, the wines cannot be more different. For the Cuvee Amaury tasting notes go here. There are significant differences between the Amaury and the Revelatio. The medium plus body, more pronounced aromas on the nose, a better viscosity and a higher acidity make this Revelatio a more interesting wine. Revelatio did not see any oak. Some of the wine that went in the Amaury was aged for 6 months in oak. I have to say that as much as it was not a perfect match for the dish (the tuna can easily be paired with a lighter red wine as well), the sweetness and the viscosity of the wine worked nicely with the sour cream based sauce. Next time I cook tuna I’ll try a red. If any reader can recommend a better wine pairing either red, either white, that can be a better match for the tuna please leave a comment. Your comments are highly appreciated. Last SAT, together with my wife, we spent a great time with Oliver and Raluca Bauer. They came to Bucharest for the weekend to present their wines from Crama Stirbey/Stirbey winery during a couple of tastings organized in the Old Center. They were finally not in a hurry in the city so we had the chance to spend a little bit more time together, to have a longer lunch and enjoy some wines. This was a great opportunity to find out more about an existing project that Oliver wants to start developing in Bucharest as well. During the last years he organized a few thematic tasting events with older vintages or harder to find wines in Sibiu. Usually the each event brings together 12-15 people to taste f.e. 10 to 30 years old wines from Bordeaux, Burgundy, Spain, Germany, Austria or other countries. The advantages of such a tasting are the costs: one can spend 30-50 EUR for an evening and taste multiple interesting wines with other wine lovers and exchange impressions and opinions. By splitting the cost among the group members the financial burden is easier to handle. There can be 8-12 different wines tasted (if wanted also more), depending on the number of participants and the amount agreed to be spent. We already visited a couple of restaurants to choose the future location for the event. The first event is planned to take place in the spring of 2011. Any person interested to attend the wine tasting events in Bucharest can leave a message to oliver.bauer@cellartales.com or raluca.bauer@cellartales.com and as soon as the details(cost, location, wines) are established we will be informed. For now I would suggest the first event to be themed: old Bordeaux or old Burgundy. Other proposals are of course welcomed as well. As we were all wine lovers, we couldn’t have lunch only talking about wine and without actually drinking some. So here are the wines tasted in the order we did. A wine from Thassos, Greece. A blend of Sauvignon Blanc and Assyrtiko with 12.5% alcohol. This is a wine from Valais AOC, Switzerland. Dole is the generic name for a blend of predominantly Pinot noir with Gamay from this region. The wine has a ruby red color with brick tones on the rim. It has the nose of a nicely aged Pinot, with some barnyard, a little bit gamey, some stinky cheese, all mixed with pure strawberry liquor. A really nice nose as weird as it may sound. In the mouth the wine is youthful, vibrant, with medium body, nice acidity, beautiful sweet fruit and earthy, meaty tones. There is a medium aftertaste in this tasty aged wine that goes so well with food. Excellent wine. I enjoyed this wine a lot with a dish of freshly made pasta with shrimps and zucchini. 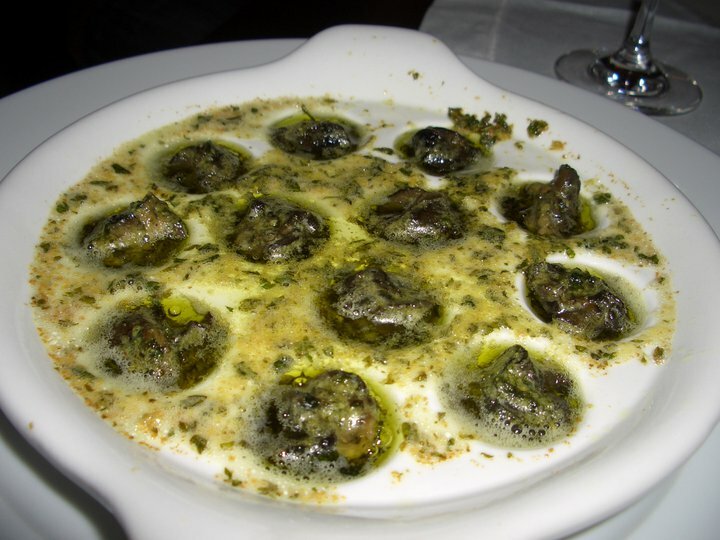 The wine went very well, probably better, with Escargots Bourguignon as Oliver tried. 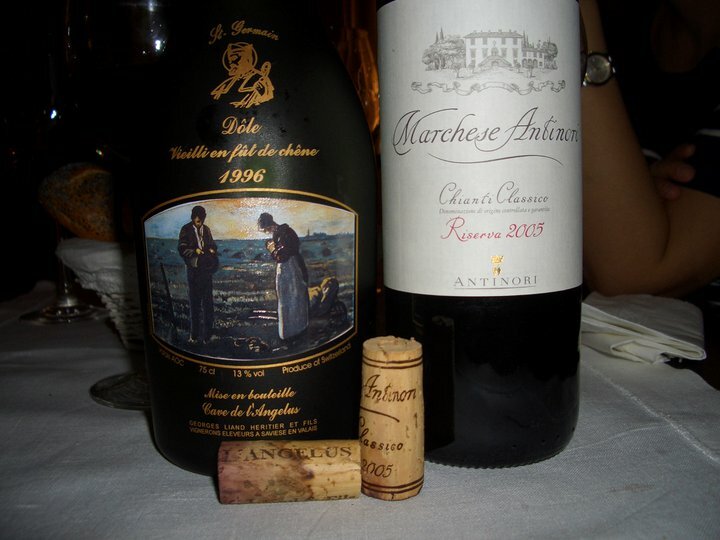 After the 1996 Dole the 2005 Antinori Chianti did not go very well. However the wine gained a new dimension that I did not feel it previously: a clear aroma of barnyard. It was very interesting to compare the mature wine with the younger one. The 1996 Dole developed beautiful complex aromas that made it hard to beat. Still, the Riserva was a Very good to Very good+ wine. 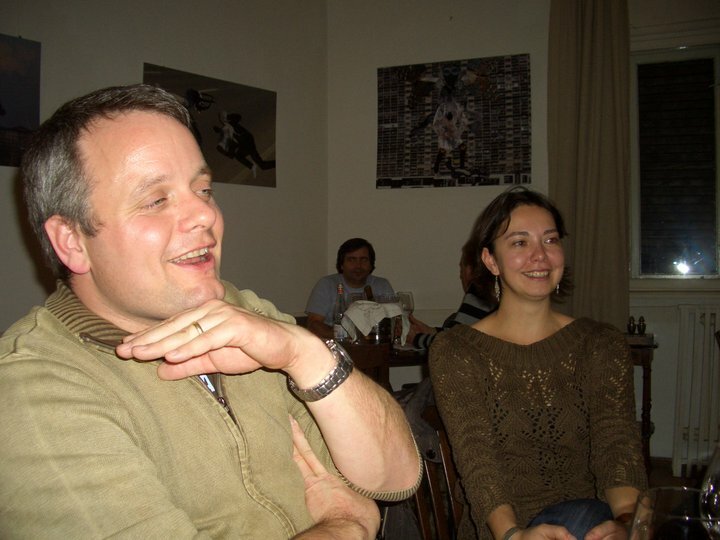 We enjoyed the company of Raluca and Oliver a lot and we are certainly looking forward to meet them again soon. Also on a positive note for Crama Stirbey and a negative note for us, the consumers, it seems that all of their remaining whites are sold out. There is however the 2007 Genius Loci Feteasca Regala soon to be launched, so there is still hope. The better news is that Oliver characterized the new 2010s as German like wines: low alcohol, high acidity and plenty of character. I am certainly looking forward to try their new 2010s next year. THU evening we had a lovely home made Greek food dinner prepared by our good Greek friend Christiana. Tasting that Feta and the other dishes prepared with products directly from Greece, brought back memories from our September vacation in Thassos: the shinning sun, the nice warm yellow sand and the clear blue sea. A good way to attack the Yellow code warning for heavy rain and snow issued by those guys from the Weather department for this coming weekend for Romania. Taste and olfactory memories are very powerful and usually underestimated. However man cannot leave only on bread and water, in this case on olfactory and taste memories. This dinner was a great opportunity to share and do a comparative tasting with a small group of good friends(we were 7 overall and only 4 of us sampled wine) of some of the top white wines from three Romanian producers. Both the Solo Quinta 2009 and the Terra Romana Cuvee Amaury 2009 received directly from the producers for sampling. 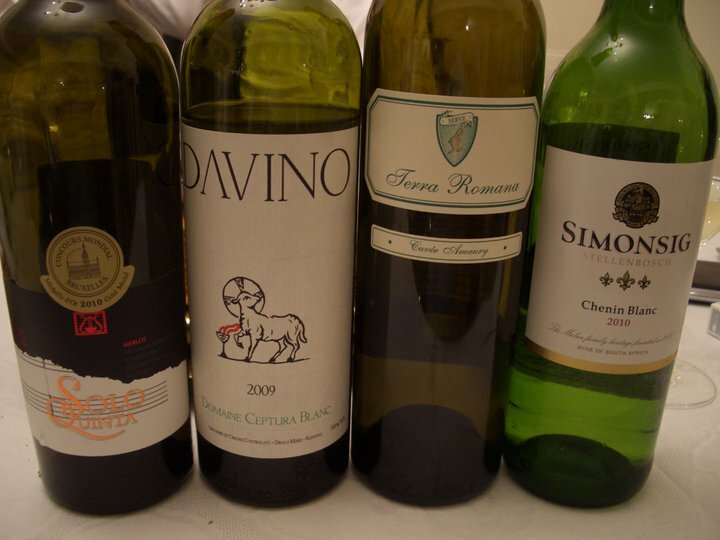 The remaining two Davino Domaine Ceptura Blanc 2009 and Simonsig Chenin Blanc 2010 were offered by the host so that the comparative tasting can be more extensive. We tasted all the wines from separate glasses during the whole meal and paired each of them with fish, salads, different types of cheese and meat dishes. One common thing about all three Romanian wines sampled was the lack of concentration of the texture in the mouth. It is important to say that the South African Chenin Blanc from Simonsig was tasted the last and being off dry was a little bit out of place for this tasting. The residual sugar was unpleasant after the three dry Romanian whites. Here are my tasting notes for the wines. I do not know what is the selling price for this wine on the market. This was the only wine of the flight aged in oak for 6 months. It is a blend of Sauvignon Blanc and Riesling. Also a blend of Sauvignon Blanc and Riesling with no oak. Solo Quinta is a blend of four white grapes with the juice from a red grape. For 2009 the red grape chosen was Merlot. The other four white grape varieties are Feteasca Regala, Sauvignon Blanc, Chardonnay and Muscat. The wine has not seen any oak. The wine has a clear green-yellow color. The muscat is very strong on the nose from the get go, with a distinct sweet flavor. Floral aromas of linden, acacia, elder and roses, flavors of grapefruit and apricots come out of the glass. In the mouth the wine is medium body with a lifting acidity, with flavors of red currants, apricots, honey, vanilla and a fresh spiciness that come together to make a round and balanced wine. The wine has a fresh medium finish and felt more concentrated than the first two wines. Very good, potentially Very Good+ wine. As much as I usually like this wine, this evening it felt out of place. Too sweet after the three whites that qualify as dry wines. With the deepest yellow color of the four wines tasted, the wine has a fresh nose with plenty of spicy aromas, grapefruit, lemon and orange zest. In the mouth the wine is off dry(I didn’t like the sweetness tonight) with balance, good acidity, a medium body and good concentration holding the 14.5% alcohol in great form. A medium finish for the wine with the highest alcohol level for the night. Tonight Good+ wine. This is my classification for tonight’s dry wines: 1) 2009 Solo Quinta; 2) 2009 Davino Ceptura Blanc; 3) 2009 Cuvee Amaury. After a gargantuan meal a nice cake seemed like a great ending. As much as all these wines are interesting on their own, it is a comparative tasting that gives one the chance to compare and choose the wines one prefers. Anwilka is Bruno Prats, former owner of Cos d’Estournel, and Hubert de Bouard, owner of Chateau Angelus, joint venture in South Africa with Klein Constantia. Their first wines were released starting with the 2005 vintage. 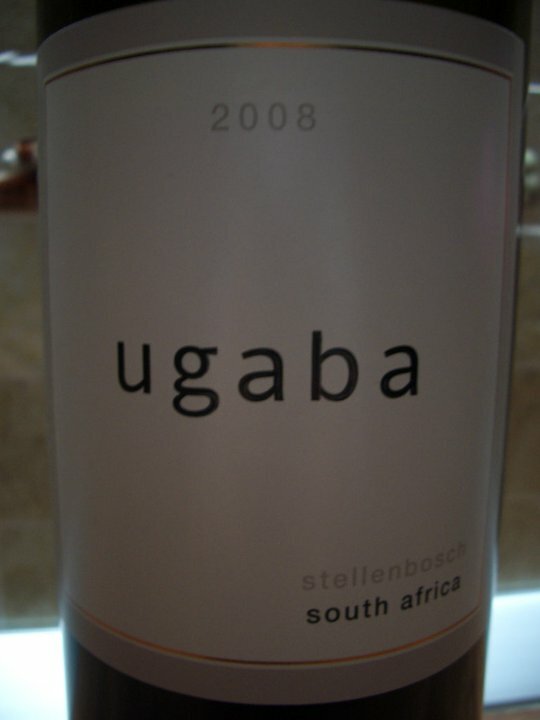 I did not taste yet their first label – Anwilka, but Ugaba, their second, is a pleasant surprise. This blend of 65% Cab Sauv, 34% Syrah and 1% Merlot is their second label. The wine spent 10 months in 30% new French oak barrels. Color is deep dark red almost opaque. Nose of a youthful wine, with a slight sweet sensation of ripe red berries and elegant French oak. In the mouth this Bordeaux like wine is medium body with round and firm tannins, good acidity that doesn’t make the wine heavy on the palate and nicely balances the 14.5% alcohol. 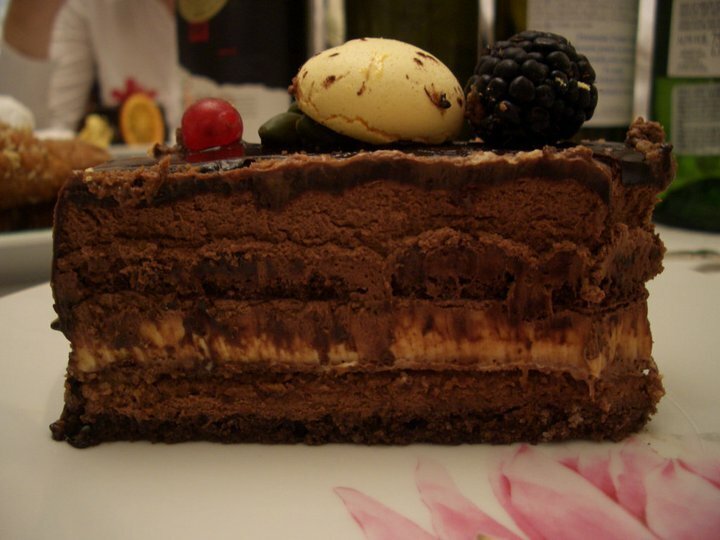 The aftertaste is medium with a pleasant bitterness finishing with dark chocolate and black tea. The wine gains in complexity paired with lamb chops and a Provencal sauce. Very good- wine.